With the Olympics officially starting and the swimming events guaranteed to set a few more records, you have to wonder how swimmers can continue to improve? Haven’t we reached the pinnacle of a human’s physicality by now? If we get any more good at swimming in the water, we’re going to continue doping, or we’re going to become merpeople. 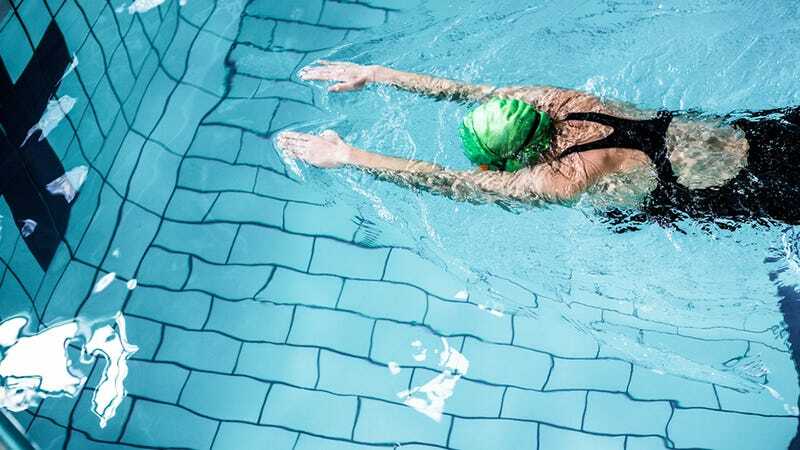 Whether or not we’ve reached our physical peak, we can still get better at swimming, at least according to researchers at Bielefeld University in Germany who, in conjunction with a system created by Cluster of Excellence Cognitive Interaction Technology (CITEC), hope to improve swimmers’ technique by utilizing sound data. It’s through a process called “sonification,” which takes data and converts it into sounds that the swimmer could interpret. In this case, how the pressure of the water flows over the swimmer’s hands—which are usually the only things they can see—is measured by a system that includes two gloves with tube ends that serve as pressure sensors. These are connected to a measuring instrument, which transmits data to a computer, which then converts the measurements into sound, which the person can hear over headphones. Basically, it creates a song that the swimmer can use to adjust their form. “If a swimmer registers how the flow pressure changes by hearing, he can better judge, for instance, how he can produce more thrust at similar energy costs,” said Dr. Bodo Ungerechts, who worked on the project. “By using this system, swimmers develop a harmony - a kind of melody. If a swimmer very quickly masters a lap, they can use the recording of the melody to mentally re-imagine and retrace the successful execution of this lap,” he added. In a test in Sept. 2015, 10 professional swimmers, including three who qualified for international competitions, tested the system and found that it did help them to improve their technique by providing instant feedback. Swim teams at the PSV Eindhoven (Philips Sports Union Eindhoven) in the Netherlands also used it for two months. Researchers hope to have the system be streamlined enough so that swimmers can use it without the aid of another person, and hope to incorporate it into more training programs. As for those interested in seeing how the system could be used on a larger scale, we’ll see if Olympic-qualifying swimmers can get some use out of it. That way we can continue to have more records broken by athletes. And that’ll be done without doping, especially since that seems to be the other way we try to increase our athleticism.